Are the Black Caps Really a Better Test Side than the Baggy Greens? There’s something you can see right now that hasn’t been seen for thirty years. It’s not a rare comet: it’s an official Test cricket rankings that has New Zealand higher than Australia. It might come down to decimal points – both teams are on 97 overall ratings points – but the Black Caps are in fourth, the Baggy Greens in fifth. Do the Black Caps deserve to be considered a better Test side than Australia? This article has a look. We will comparatively examine the relative strengths of either nation in the positions of established opener, junior opener, No. 3, No. 4, No. 5, allrounder, wicketkeeper, first seamer, second seamer, third seamer and spinner. This article will compare them at all positions, championship boxing style, with an advantage in one of these positions worth a one point win and a knockdown advantage worth a two point win, to be judged along eleven rounds. On the briefest glance, this looks like a hands-down win for Warner. He boasts a Test batting average of 47.94, with 20 centuries, compared to Latham’s Test average of 38.84 with six centuries. Warner’s overall average, however, masks the stats of a home track bully. Although Warner has a considerably higher average than Tom Latham, the two players have a similar average when batting away from home: Warner averages 36.81 away compared to Latham’s 38.46. This is the reason for Warner’s reputation as a home track bully – Latham averages about the same at home as away but Warner averages 59.12 at home. In all, you’d probably have to give this one to Warner on the basis that he is more likely to play an innings of matchwinning destructiveness once in than Latham is, and that Latham is yet to play a definitively excellent innings against a top-flight team yet. Jeet Raval is a batsman in the style of Mark Richardson, and in a seven-Test career has functioned an average of 44, the same as Richardson. An average of 44 for a second-choice opener is incredible by recent Black Caps standards, and if Raval can keep his concentration and stick to his simple, AK-47esque simple brutality, he could be excellent in the future. Matt Renshaw is even less established. He does have one Test century, which Raval has yet to manage, and it’s a big one: a 184 against a visiting Pakistani side this January. Apart from that, he’s not shown too much, maintaining a decent but unremarkable average of 36.64 from ten matches. This one might be marginal, but it’s still New Zealand’s. Steve Smith is currently at the top of the Test batting rankings, and there’s few who could really dispute that based on the numbers. He sits at 936 ranking points right now, befitting his stratospheric average of 59.66. Unlike the days of Ricky Ponting, however, New Zealand boasts a No. 3 in the same league. Kane Williamson is not far behind Smith on the ICC rankings, at 880. Coming off a series in which he scored two hundreds in three matches against the excellent South African attack, Williamson can lay claim to being at least a pretender to Smith’s throne. Smith is almost universally regarded as superior but here’s a curious statistic: since the start of 2015, Williamson averages 68.37 compared to Smith’s 67.79. Smith has certainly accomplished more in this time frame, but that’s primarily because he has played 15 more innings than Williamson has. Smith has scored centuries at a marginally higher rate than Williamson during this time: 13 of them from 56 innings for a 23.2% chance per innings. Williamson has scored 9 centuries in 15 fewer opportunities than Smith, which works out to a 21.9% chance. So in terms of who’s better right now or in the immediate future, on balance it goes to Smith but only by a whisker. Over the last three years, Taylor has averaged 51.21 with the bat. That’s good enough to see him ranked 14th in the world, ahead of Tamim Iqbal, Dean Elgar and Faf du Plessis. He’s been a world-class presence at No. 4 for the Black Caps for many years, and is one behind Williamson and Martin Crowe on the all-time New Zealand Test century scorers table. Handscomb has only played in 10 Tests, and cannot really be considered an established player. He has a 50+ average, which is very good for ten Tests, but his First Class average of 41 suggests that this will come down a fair bit. If you consider that Ross Taylor scored the highest ever Test score by a visiting batsman to Australia – 290 in Perth – this is a knockdown win to the Black Caps. Henry Nicholls could be considered semi-established at No. 5. He hasn’t been excellent so far in Tests – averaging 31.94 from 21 innings – but in his last series it looked like he had turned a corner. On a pitch and against a bowling attack that Kane Williamson could only manage three runs in two innings against – in the second Test against South Africa – Nicholls came in at 21/3 and played a rearguard 118 to take New Zealand from the brink of obliteration to a semi-competitive total. He’s got the goods, it’s just a question of consistency. Australia’s choices for No. 5 are yet to show either the goods or consistency. Sean Marsh has been unable to make that spot his – despite averaging 50 there over ten innings, Marsh has scored almost everything at home, and Hilton Cartwright, heralded by many on account of his First Class average of over 50, is yet to establish himself here (or anywhere). This one seems like New Zealand’s as well, thanks to Nicholls’s 2017 average of 48.66. This ultimately suggests that the Black Caps batting is better than the Baggy Greens batting overall. This may be the first time this has ever been true. Lord Colin de Grandhomme is now officially considered the Black Caps’ premier allrounder. In six Test matches he is yet to play a really good innings with the bat, but has on several occasions had an important impact with the ball. The most notable of these was a 6/41 against Pakistan that won New Zealand a low-scoring shootout. Maxwell, in comparison, seems like a straight-out gamble that hasn’t paid off. Despite being one of the best pure hitters in any format of the game, he has only managed to pass 50 once in 14 Test innings. Although a batting average in the mid 20s compares favourably with what de Grandhomme has hitherto achieved, his bowling returns of 8 wickets @ 42 are much poorer than de Grandhomme’s 16 wickets @ 25. This one goes to de Grandhomme on the basis of his bowling being considerably better. Since the start of 2015, BJ Watling has not only given excellent service with the gloves but has scored over 1,200 runs at 42.56, with three centuries. In this regard he has been world-class for the Black Caps and probably the fourth name on the team sheet after Williamson, Taylor and Trent Boult. Matthew Wade, by contrast, has struggled to dominate in the role and could be said to be picked by default. Over his last 10 matches he has averaged 20 with the bat and so this is fairly another knockdown victory to the Black Caps. Since the start of 2015, Josh Hazlewood has taken 109 wickets @ 25, cementing him as one of the world’s premier Test bowlers. Only Jimmy Anderson is ahead of him of seamers on current rankings, and it’s easy to see how Hazlewood’s mean accuracy and unpredictable bounce has him at the top here. By every measure, this is a long way ahead of what Tim Southee has achieved. Southee has 70 wickets @ 34 since the start of 2015, with the only truly matchwinning performance a six-wicket bag to destroy Pakistan’s first innings in Hamilton in 2016. Southee, even with all his experience, is a much weaker bowler than Hazlewood and Hazlewood is still improving so this would have to go down as a knockdown victory to Australia. Mitchell Starc and Trent Boult have a similar career bowling average of about 28 runs per wicket. Starc has, however, been much stronger over the past 3 years. Since the start of 2015 he has taken 103 wickets at under 25 per wicket. 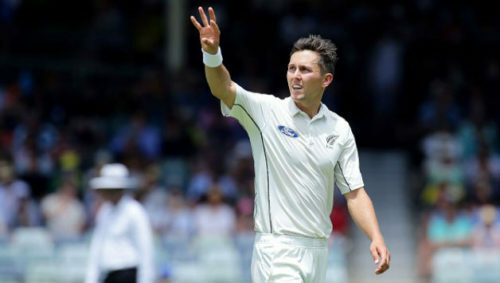 Boult has still been very good, with 84 wickets @ 30, wrecking England twice, Australia once and South Africa once during that time. One also gets the feeling that he has been unlucky recently, with long periods of sustained pressure inexplicably not ending with wickets. In the end, though, Starc has a legitimate claim to world-class status whereas Boult is probably at the level below still. Neil Wagner is the highest-ranked Black Caps Test bowler at 10th place. It’s easy to see why – since the start of 2015 he has taken 72 wickets at 24.41, with a sub-50 strike rate. Unlike his teammates Boult and Southee, Wagner doesn’t need as much assistance from the conditions to be effective, and he’s a genuine weapon anywhere. Pat Cummins is an excellent bowler, but it’s not clear that we’ve seen enough of him to argue that he’s better than Wagner. He came back to the Test arena this year after six years of injury-enforced layoff, and he looked good in taking 14 wickets at just under 30. Perhaps in five years Cummins will be decisively ahead on this count, but for now Wagner has much more proven effectiveness. This one is interesting because Santner is clearly the better batsman and Lyon clearly the more effective bowler, it’s just a matter of how to split the balance. Lyon averages 28.73 with the ball since the start of 2015, with 135 wickets and a couple of Man of the Match efforts in there. This is only three runs per wicket more than Shane Warne averaged, but in a more batter-friendly era. Santner, by contrast, averages just under 40 with the ball and has only claimed 31 wickets so far. Santner does however average 26 with the bat. Lyon, by contrast, is a genuine tail-ender, with a high score of 40 from 69 Tests and an average of 11. In the end, you have to say that bowlers are there to bowl, not to bat, and so Lyon’s advantage here ought to be decisive in his favour. Even if it’s agreed, on the basis of the above analysis, that the Black Caps are stronger at Tests than the Baggy Greens, the margin is extremely slim. The Black Caps might be genuinely stronger with the bat, for the first time in the history of Test cricket, but both of the Australian opening bowlers are stronger than their Kiwi counterparts and so is their spinner. In the Australians’ favour it could be argued that good bowlers are more important than good batsmen and so the difference between Hazlewood and Southee ought to weigh heavier than the difference between Taylor and Handscomb. If the two sides would play each other on neutral soil in a Test match now there might be a slight advantage to the Black Caps. That there might be a slight advantage is the most you can really say. Next Next post: Should People Lose The Right to Vote When They Get the Pension?